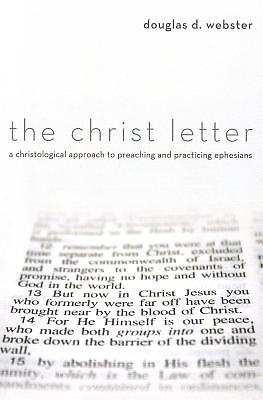 Description: The Christ Letter is a conversation partner for pastors and students of the Bible who want to wrestle with the meaning of the biblical text for Christian living today. Scholarly commentaries perform an essential task, but they often leave today's believers on their own when it comes to making Paul's letter come alive. Doug Webster weaves together deep biblical insights, penetrating cultural perspectives, and stories of transformation into a pastoral commentary that promises to release the powerful message of Ephesians. This commentary offers lines of thought, illustrations, and applications that carry the gospel into the present situation. Webster draws out the personal and practical impact of Paul's spiritual direction for today. The Christ Letter gives pastors a fresh perspective and a better handle on how to preach Ephesians effectively. Webster inspires and guides faithful disciples in what it means to follow Jesus in a Christ-centered way. Endorsements: "In this volume Doug Webster brings together a wonderful combination of biblical scholarship, pastoral sensitivity, and a deep awareness of contemporary culture to provide a commentary that is at the same time exegetically sound, relevant to today, and an engaging read. Those preaching, teaching, or simply studying through Paul's letter to the Ephesians will find this volume immensely helpful." --Mark Strauss Bethel Theological Seminary "Doug Webster has thought deeply about the theological and ethical riches of Paul's letter to the Ephesian Christians of the first century. He has then drawn on many years of pastoral and teaching experience to connect this message to the church and culture of our own time and place. The result is a book that, like Ephesians itself, is uplifting, exhilarating, sometimes hard-hitting, and richly edifying." --Frank Thielman Beeson Divinity School "Doug's insight into Ephesians is both broad and deep: he digs deeply into Paul's theology of Trinity, salvation, and the church, and he applies these truths broadly to every area of a believer's life. Perceptively addressing the snares of our culture, Doug challenges readers to hear Paul's clarion gospel call anew. Doug draws on a wealth of contemporary stories and authors, as well as literary classics, as he explains Paul's teachings on sin, power, service, praise, and prayer." --Lynn H. Cohick Wheaton College "Doug Webster's preaching commentary on Ephesians will awaken a spiritual wonder about the possibility of communicating theologically rich ideas from the pulpit. Shallow reflections--be forever gone The christological focus combined with a pertinent and piercing cultural critique makes this commentary a welcome addition. I read this book at sunset on our front porch in the lingering daylight over several evenings. Like having to say goodbye to summer after an enjoyable season, I was sad when it was done." --William J. Webb Tyndale Seminary (Toronto, Canada) About the Contributor(s): Doug Webster is Professor of Pastoral Theology and Preaching at Beeson Divinity School in Birmingham, Alabama. He and his wife, Virginia, also serve Central Presbyterian Church in Manhattan, New York.